The Antonina Leśniewska Museum of Pharmacy was founded in 1985. It has been a division of the Museum of Warsaw since 2002 and is currently located on 31/33 Piwna Street, less than 200 metres away from MoW’s main seat. The Museum of Pharmacy is named after the founder of the first pharmacy in the world that employed women only. Antonina Leśniewska (1866–1937) took up the fight for the access to higher education in pharmaceutical sciences for women. Officina sanitatis is the Latin name for a pharmacy. Until the mid 20th century, pharmacies not only sold medicines, but also produced them as well as cosmetics, inks, candles and sweets. Proprietary drugs, produced by the pharmaceutical industry, entered distribution in the late 19th century. The exhibition presents interior of a Polish pharmacy from the 1920s and 1930s. 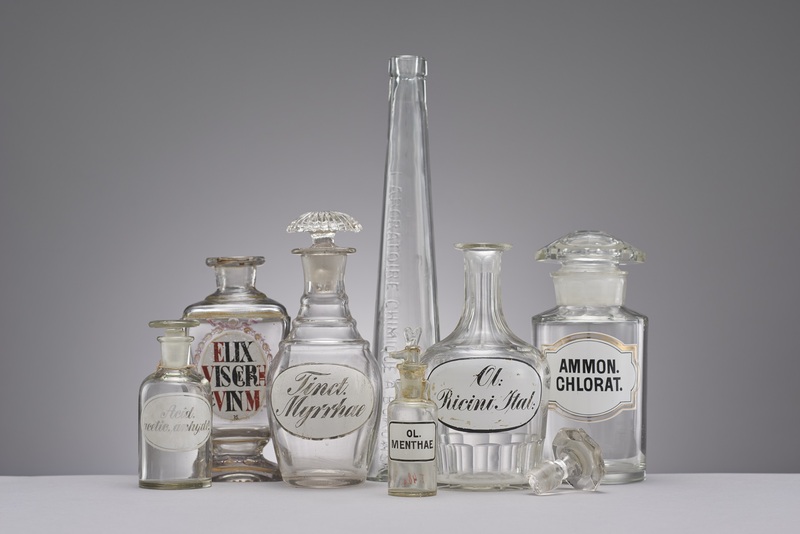 The exhibition presents pharmaceutical utensils and containers, as well as proprietary medicines, in order to show the effects of various medicines on the human body. The pharmaceutical instruments create a narrative about the history of pharmacy. Due to its high resistance against chemical agents, glass was the main material used for making pharmaceutical containers. Contrary to metal cans or wooden boxes, glass does not absorb humidity, does not mould, is not reactive to the contents and is easy to clean. Antonina Leśniewska (1866–1937) took up the fight for the access to higher education in pharmaceutical sciences for women, as did her great contemporary Maria Skłodowska-Curie in sciences in general. In 1900, Leśniewska challenged stereotypes and was one of the first women in the world to obtain a Bachelor of Pharmacy degree (prowizor) and a year later – Master of Pharmacy at the Military Medical Academy in St. Petersburg. The degrees made it possible for her to open the first pharmacy in the city to employ women only. In 1918, she returned to Warsaw. In 1934, she opened Marszałkowska Pharmacy at 72 Marszałkowska Street. The only surviving copy of her memoirs belongs to the collection of the Museum of Pharmacy. Up until the 6th century, healing methods in Japan were based on shamanist practices. Chinese medicine chu-i, known in Japanese as Kampo or the “Chinese method”, began to spread through the Japanese islands in the 6th century. Adapted by the Japanese culture, it has retained its original character until today. Kampo medicines are today an integral part of the Japanese pharmaceutical industry. The 2017 opening of the Museum of Pharmacy, a division of Museum of Warsaw, was co-financed by the Ministry of Culture and National Heritage as part of its 2017 Museum Support Program.